This article reviews how to prepare to file VAT, how to make necessary adjustments, and how to run the reports that you will use in your bridging software. The explanations and advice in this article are based on Wave’s understanding of relevant HMRC publications. While we’ve taken reasonable care in researching and preparing this article, Wave will not be liable for any loss or liability arising from errors or omissions. For certainty in managing your sales tax reporting obligations, and other regulatory obligations in the UK, we recommend that you consult a qualified UK-based accountant or tax professional, and refer directly to HMRC publications and guidance. Before you do anything else, check that you have your bookkeeping up to date in Wave, at least to the end of the period for which you are preparing your VAT return. Reconcile your bank accounts. This will help ensure that you have not double-counted or missed income or expenses. Ensure that you have accurately entered the date when you received payment for each of your invoices. Ensure that you have accurately entered the date when you made payment for each bill. Make certain that all transactions have a sales tax applied where necessary. If you have not made any purchases for your business from other EU countries, you can skip this step! If you had purchased these goods or services from a UK VAT-registered seller and would have been able to reclaim some or all of the VAT as Input Tax, you can generally do so in this case, too. To calculate the amount of tax to apply, you need to know the total of your purchases of goods or services from other EU countries. You can find that by running Wave’s standard Sales Tax Report. Do this now, and make a note of the values shown. Make sure you run this report on an accruals basis. Reverse charge VAT for EU purchases is ALWAYS on an accruals basis, even if the rest of your VAT reporting is on a cash basis. Now that you have the total purchase values, you can calculate and add the tax using a journal transaction. Wave will take the amount that you post as VAT Asset (i.e. Input Tax) and add it to Box 4 of your VAT100 return. It will add the amount you post as VAT Liability (i.e. Output Tax) and add it to Box 2. Wave knows that ECG output tax should go in Box 2, and ECS output tax should go in Box 1. NOTE: This example assumes your business makes all VATable supplies and does not use the Flat Rate scheme. If your business makes Exempt supplies or uses the Flat Rate Scheme, you will need to calculate Output VAT on purchases from the EU, but may not be able to reclaim an equivalent amount of Input VAT, meaning that the Reverse Charge may result in a net cost to your business. Consult an Accountant or Tax Adviser and refer to VAT Notice 725 to ensure you are correctly following the regulations. Follow the same process for any purchase of services. Post any other required adjustments need to your VAT calculation via further journal transactions. As with the discussion of EU VAT above, note that any amount you post to a tax as a Liability represents Output Tax in Box 1; any amount you post as an Asset represents Input Tax in Box 4. Consult your accountant or a tax professional, and refer to the VAT Guide (VAT Notice 700) for details of all the adjustments that you might need to apply to correctly file VAT. Go to Reports > Stay on top of taxes and select the VAT100 report. Complete the input fields and generate the report. Export the report as a CSV file by clicking Export in the top right corner of the report page. Import the VAT100.csv file into your chosen bridging software and submit to HMRC via that software. The UK government’s Making Tax Digital (MTD) initiative now requires VAT-registered UK Businesses (including sole traders) that turn over more than £85,000 in annual sales to maintain digital records, and submit VAT returns either directly from their accounting software, or via an approved bridging software. VAT Registered businesses whose turnover is below the registration threshold of £85,000 are not required to submit their VAT returns digitally, but may do so. MTD rules allow you to use your preferred accounting software, regardless of whether or not it directly connects to HMRC to submit the VAT100 data. If you use software like Wave that does not directly connect, you may export data into a bridging software—typically a spreadsheet—that has the ability to perform the direct upload. This rule is essential not just for smaller businesses that don’t want to pay for new accounting software, but also for huge companies with accounting software that was developed many years ago, or who have always needed to perform complex manipulation and aggregation of data across many divisions in a spreadsheet to calculate their VAT return(s). VitalTax. Currently free, but expected to start charging next year. Tax Optimiser. Free for 1st year, then £30 per year. Look for more detailed guides on using Wave's recommended bridging software coming soon. You’re done! All that’s left is to make your payment and record it in Wave—or even better, to receive a refund! 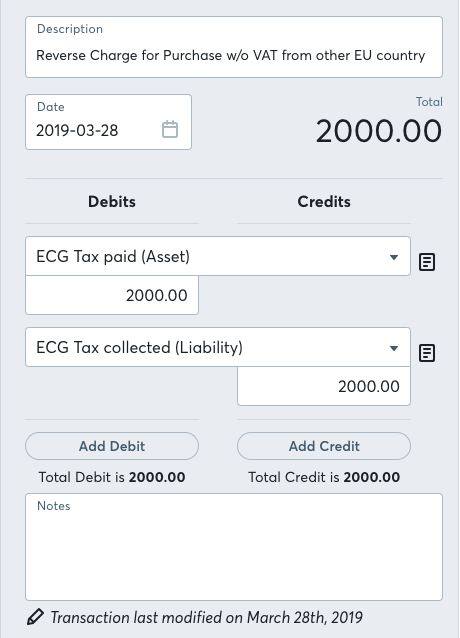 Simply record the expense or income in your relevant bank account - or wait for the transaction to appear automatically via an active bank transaction import connection - and categorize it Sales Tax Payment to Government or Sales Tax Refund from Government. If you have input/output taxes in multiple VAT codes, you will want to split the transaction in order to account the correct amount to each. Refer to the Sales Tax Report in Wave to see your liability under each VAT code.